With the Vancouver Canucks on a five-day hiatus between games, it seems like a good time to catch up on some team news. The first good news is that the team is coming home from a 3-3 road trip, which is a decent record and makes it a bit easier to forget the 5-0 pasting the team experienced in Toronto against the Maple Leafs. When looking at the upcoming homestand – six games against beatable competition over 10 days – one wonders if the Canucks might have a chance to pull themselves into playoff contention by the end of January. They play, in order, the Arizona Coyotes, Florida Panthers, Edmonton Oilers, Buffalo Sabres, Detroit Red Wings and Carolina Hurricanes. Only three of these teams have winning records, with two teams barely having winning records. The Sabres are the best of the lot, but they will be in the middle of a tough western road trip, so anything is possible. 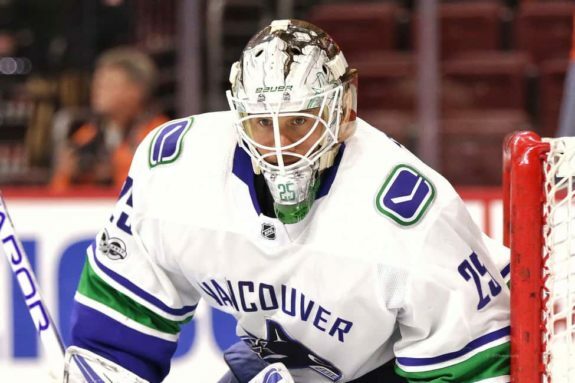 Sportsnet’s Gare Joyce, in a post about Canucks’ silver linings after their road trip, reported that the continued strong play of goaltender Jacob Markstrom keeps the Canucks in games. Against the vaunted Maple Leafs elite forwards, he kept his team in the game for 40 minutes and stopped 22 of 24 shots, many of which were quality chances. Markstrom “perseveres,” as Joyce notes. Elias Pettersson, who has played 38 consistent, surprising and sensational games this season, and by doing so, has made himself the Calder Trophy favourite, was described as walking “easily.” There’s a chance the knee injury he received when he got tangled up with Montreal Canadiens rookie Jesperi Kotkaniemi on Thursday night and fell awkwardly might not be as long-term an issue as so many Canucks fans first worried. Rookie star Pettersson and Brock Boeser are not the only young stars the Canucks have in the system. One young prospect fans have not yet seen in the NHL is the University of Michigan’s Quinn Hughes, the seventh overall pick in the 2018 NHL Entry Draft. He’s a blue-chip defenseman, and he could have played on the Canucks’ roster this season. Friedman noted that, after these discussions, the decision was made “not to do it” but to talk with Hughes once the season ends. As reported, they didn’t want to “tempt him in any way.” As a retired, long-time university professor, perhaps I am biased. However, I appreciate that university-based hockey players can use university attendance to prepare for life after hockey. The career for any hockey player (even stars) is relatively short. Even if a player plays to a “ripe old age” in hockey, 35 years old is most players’ best-before date. How is Hughes doing this season? Although his Michigan Wolverines only have a 7-7-6 record, he’s been productive. He’s scored three goals and 17 assists in 17 games this season. He might soon become a highly-valued Canuck. 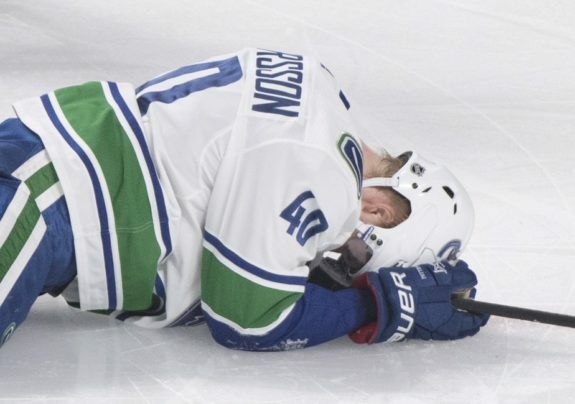 Item 4: Should the Canucks Resign Alexander Edler? Sportsnet’s Nick Kypreos reported that the Canucks are expected to begin negotiations with soon-to-be unrestricted free agent Alexander Edler about a contract extension. He clearly wants to stay in Vancouver. Fortunately for the Canucks, his desire to stay is good news because he’s playing his best hockey of the last few seasons. As Kypreos notes, Edler has a $5 million cap hit and could demand a higher cap hit on a short-term deal. He in his 13th season and has never played for a team other than the Canucks. This season, he leads all Canucks defensemen with four goals and 15 assists. Despite his strong play, there were rumors the Canucks might try to convince Edler to accept a trade. There would certainly be a market because of his strong all-around game and his success against an opponents’ top lines. The “problem” for Edler is that, because the Canucks are ahead of their rebuilding schedule, the team might entertain dealing him at the trade deadline to a Stanley Cup front-runner – say, for example, the Maple Leafs, who need a reliable defenseman. That said, if the Canucks climb into playoff contention this season, which was not expected but is possible, trading Edler for a draft pick makes no sense and would weaken the team. It will be interesting to see what develops on this front. 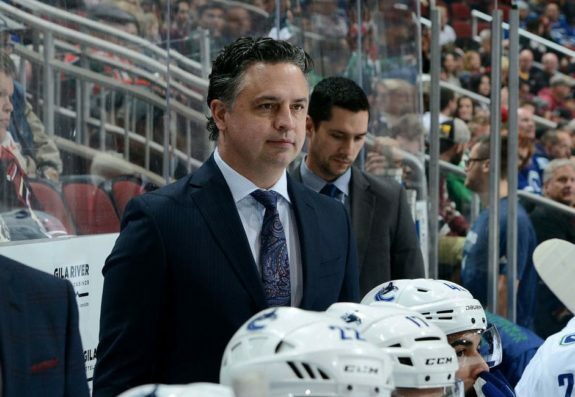 Iain MacIntyre of Sportsnet reports that the Canucks’ rebuild is moving faster than expected. He lists several good points for the season. First, and obviously, the play of 20-year-old centre Pettersson has eclipsed last year’s Calder Trophy finalist Boeser and “just about every other rookie in franchise history.” He’s already the Canucks’ best player and, like Boeser, made the All-star Game as a rookie. Second, Boeser’s still in a Canucks uniform and that fact shouldn’t be forgotten. He had a slow start this season but has rebounded nicely. Fans shouldn’t forget that his rookie season was ended by a serious back injury after 62 games and 29 goals. He might have needed the early part of the season to heal and get into game shape. Third, Bo Horvat is growing into one of the best young two-way centres in the NHL. He’s actually getting better as he matures. Fourth, Canucks goalie Markstrom is really quite young in goalie-years, and he, too, is getting better at 28 years of age. Summary: What if the Canucks Can Make the Playoffs? As I noted early in this post, there is a chance the Canucks can make the playoffs. Certainly, by the end of January, the team will have a better picture of where their season sits and how they might proceed with their rebuild. If the Canucks actually can make the playoffs, a few probabilities exist. Certainly, Pettersson will establish himself as the Calder Trophy favorite, and he might also receive votes for the Hart Trophy. Green might be mentioned for the Jack Adams Trophy and his “tough love” program will have proved to work well with his young team. Finally, the NHL will have learned that the Canucks are a viable team again. Currently, with the exception of Pettersson’s still too soon to know injury, the Canucks are starting to use their crutches for firewood. Winger Sven Baertschi and centre Brandon Sutter are back after extended injury absences. Who knows? 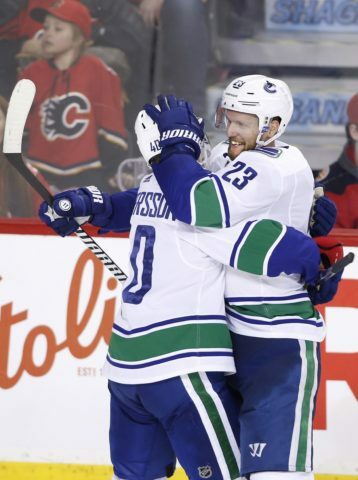 If Pettersson can return soon, he and Boeser could build a great partnership. And, if the middle of the lineup can establish its play, I’m not ruling out a playoff run of some sort.